KINGDOM HEARTS III In 7/4 Famitsu Weekly! It's been a week since KINGDOM HEARTS III was announced at the 2013 Electronic Entertainment Expo during Sony's press conference, and we are all still trying to soak up all of the new information. Many fans have been awaiting this announcement for some years now and with the release of KINGDOM HEARTS 3D [Dream Drop Distance] last year, the stage for the next and final installment in the Xehanort Saga had been had finally been set. The newest issue of Famitsu Weekly (7/4) that has come out today covers all of the new games revealed at E3, as well as a new interview with series director Tetsuya Nomura on KINGDOM HEARTS III and FINAL FANTASY XV. In the interview Nomura discusses that there has been nothing decided on the possibility of Riku and Kairi being playable characters. He also mentions that KH3 is the end of the Xehanort Saga, and briefly discusses the new "Kingdom Shaders" that the team plans to use to make an authentic Disney look for each world. Nomura tells fans to expect more information on KINGDOM HEARTS III at Tokyo Game Show 2013 in September, and the Japan D23 event being held in October. Update: Tai Yasue, co-director of KH3D and Re:Chain of Memories, will serve as co-director for KH3. Rie Nishi, producer for KINGDOM HEARTS 1.5 ReMIX, is also coming on as producer for KH3. Thanks to Zephyr for translating the highlights of the interview! ・In the story, Sora goes off to find a “key that returns hearts” and travels to various Disney worlds. ・The CG characters that were introduced are: Sora, Donald, and Goofy. ・It is a direct continuation from KINGDOM HEARTS 3D and the selection of new worlds is underway. It is the final battle between Master Xehanort in the last chapter of the Seeker of Darkness saga. ・Other than Sora, will we be able to play as Riku and Kairi? : I can’t say no to the possibility. ・Visuals: We continued to explore on how should a next generation KINGDOM HEARTS should look like and we tried to make the textures to closely resemble those of Disney illustrations. From there, it was updated. ・From numerous attempts by Mr. Nozue, the “KINGDOM SHADER” developed visuals that created those textures. ・Action: In the demo, the moments were a lot more rampant. There will be more adventurous experiences, KINGDOM HEARTS III will utilize three party members, in every world NPCs can also participate in these flashy battles. As one progresses, the AI for friends and foes become different. ・Sora learned the Keyblade’s truer strength during the Mark of Mastery Exam. ・The development team of FINAL FANTASY XV and KINGDOM HEARTS III have a friendly competition between each other. There is also a response to a sneak preview, online compatibility is being considered and please wait for more information in the future. This year, TGS in September and also D23 Expo Japan will be revealing more information. Click here for a recap of the information revealed at E3 2013! 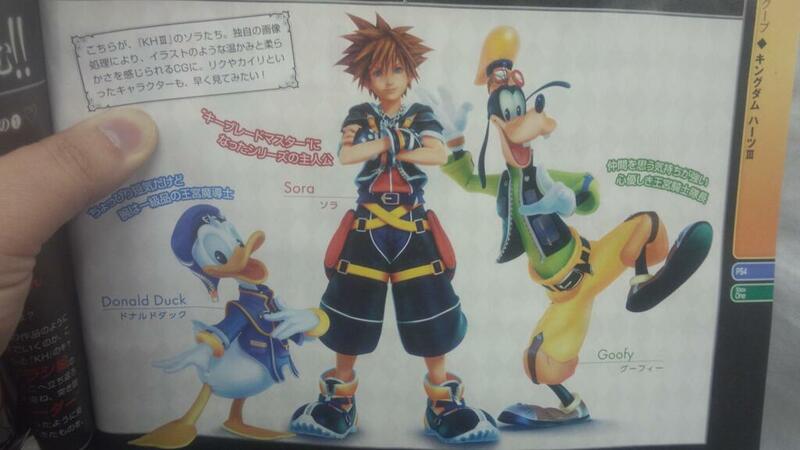 Edit: Thanks to ArikaMiz, we can see new renders for Sora, Donald and Goofy! Playable Riku and Kairi? Make it happen, Nomura! You can do it! Nomura tells fans to expect more information on KINGDOM HEARTS III at Tokyo Game Show 2013 in September, and Japan D23 event being held in October. Honestly, I'd much rather have information on 2.5 at this point. I was never one of the people to whine about KH3 since Nomura said time and time again that it WOULD eventually be made. I want a confirmation of 2.5, specifically that the version of BBS they'll use will be the Final Mix. Expected I guess, can't wait for TGS, maybe they will have a proper trailer. I cant wait for the interviews and i can;t wait for the chucckles. I hope he can let us know how much time has gone by since ddd and kh3. Why wouldn't they use Final Mix? They set the standard with 1.5+if it was vanilla japanese BBS they would have to explain why the HD collection version of BBS had less content than the PSP version that was released in the west. Using FM is pretty much less headaches for them and I cannot think of a single reason for them not to use it. Only reason I'm paranoid of it not being FM is because when they show those clips in the 1.5 credits, we know that KH2 will be FM because of the palette swapped Heartless. But there's no evidence to point to BBS being FM. So, even though it's likely, we don't KNOW that it'll be FM. And I sure hope so. September can't come soon enough. 1.5 and TGS within the span of two weeks is going to give me a Kingdom Hearts induced high. Well lets think about this even more: can you imagine what the heck they would answer when asked why two of the games were Final Mixes and one of them wasn't for no reason at all. Plus for what its worth the FFX collection has both games being the international version so it would be extremely strange for them to have vanilla BBS. Even vanilla KH2 makes more sense because western version didn't have any bonus stuff. I sure hope you're right. I so badly want to play BBSFM. I would be geeking out over KH2FM too, but I imported that one. Couldn't wait for an international release (and good thing I didn't!). I'm glad, honestly. Don't get me wrong, the trailer was spine-tingling to say the least. But the graphical style during the "gameplay" (since it was confirmed as a CGI movie) still looks strange to me. But I'm not worried. There has yet to be a KH game I didn't think was a flawless 10/10 experience. Yes, even Re:coded. Teaser=90%. Don't expect much tho. I'd like to see Soras new design tho since Nomura did lil teasing already. That or the first new Disney world. I mean would be very strange if Nomura is saying there will be more at TGS and all he would do is make another silly interview. Usually you'd always get a lil teaser at least. Pretty much. If they announce 2.5, that news will be on full blast. I'm sure Nomura will talk about KH3 enough to whet our appetites, but it probably won't be as huge as the E3 reveal. Yes certainly it won't be much this early. Hard to say what they would tease/show anyway. The first teaser for DDD was IIRC very early in 2011 and it still had the old designs of Riku+Sora but it confirmed Hunchback world and showed the flowmotion in action. I expect much lesser teaser with prolly more CGI since TGS in the end is very soon after the reveal event that was E3. I'd expect the first ''real'' trailer to surface either next years E3 or TGS where they show the first taste of real gameplay and how it looks in action. I hope Sora's new outfit looks as great as his KH2 outfit. I didn't care much for the DDD outfit, although I think the reason for that was because he looked like himself from KH1 (which I still don't understand why exactly Nomura did that). Hopefully Riku will be playable at the very least even if Kairi isn't. DDD really built Riku up as a character and showed that he deserves to be considered a hero, just as much as Sora. Especially considering the role we know he's going to play in KH3, it seems like it would be fitting and even beneficial to have him as a playable character. So regarding Riku and Kairi, I'd prefer if they did it like in KH:ReCoM. You beat the game as Sora and then unlock Riku's and Kairi's story. Since Nomura said KH3 will be focusing on Sora, I doubt this will happen, but I think it would be cool if there were a three-way story like in BBS. Sora, Riku, and Kairi. We already know what Sora and Riku will be doing in KH3, so there could very easily be two separate story modes. But at the same time, I do love the way the first two numbered titles focused on Sora, so if they don't, I won't be upset. He also said nothing had been decided on whether or not Riku and Kairi would be getting their own playable scenarios. Article updated. Check it out and thank Zephyr for the translations! The development team of FINAL FANTASY XV and KINGDOM HEARTS III have a friendly competition between each other. This year, TGS in October and also D23 Expo Japan will be revealing more information. TGS in October? That can't be right can it? The website for TGS 2013 has September 19-22 listed as the dates. i predict 2.5 announcement + trailer at TGS, and a more in-depth teaser for KH3 revealing a few important things, mainly Sora's outfit and who knows what else. from the sound of it September is still way too early for presentable gameplay to be ready. I think it's too early for even Sora's new outfit to be revealed honestly. I think TGS will focus on 2.5 with little bits of info about 3, nothing more. I am so curious to know what exactly they meant by this. I don't get the whole thing about the true strength of the keyblade either. I mean, wasn't it Riku who learned the ability of the Keyblade to give people a Birth By Sleep? Unless it is that the data that Riku found will be related to this 'truer strength' and because it was research on Sora perhaps it will only be him who can utilise the info? A reveal of a new world (at a push a tiny amount of gameplay, but not a demo or anything) in a new teaser would be fine by me. I hope so, waiting for TGS will be a pain otherwise. Interesting; the Keyblade's true strength. I wonder what that is? Still I'm so excited to see Sora's new outfit. I hope it's revealed and TGS. Not bad. We got a little new info here. I still can't shake the thought of graphics junkies complaining though as some have. I think that's something we would've heard about in DDD. Heh, I called it. Tai Yasue is the de facto director. Not surprising of course but still good to have confirmation. I really hope Riku and Kairi are going to be playable that would be awesome. I really want to see Kairi develop as a character in this game giving her a scenario might be the best thing in this regard. I'd totally be down with that. But I'm not sure how well that would work seeing unlike CoM their stories this time will probably very interconnected like it was in BBS. Also what's with this talk about a new outfit for Sora did I miss something? I hope we get a teaser trailer at the TGS I really want to know how this Kingdom Shader will play out. "A key that returns hearts"
Sounds dodgy to me. What happened to Ansem's data? I'm sure he hasn't excluded it, but having that down as the main plot point sounds a bit underwhelming. What, all this time there existed a keyblade that returns hearts? And everyone had Mickey syndrome? No, Sora and Riku both learned the true strength. They both learned how to awaken sleeping hearts, evident that Sora and Riku both unlocked the seven keyholes of sleep. I'm assuming Nomura's reaffirming the fact. I hope 2.5 will include somthing that mentions to kh3. Mabey another secret trailer. Most likely. Nomura even said there wouldn't be any secrets in 1.5 and yet we still got that hint about 2.5 in the credits. I'd be surprised if there wasn't a teaser for KH3 in 2.5, especially since the remasters are meant to be a "prep-course" for those who have ignored the series since the release of KH2. Which article was that? And does that mean that Kairi and Riku might also get redesigns? Because I think those two need it more than Sora does. Not sure which specific article, but check the E3 recap page. I think it has it. But Nomura said nothing about Riku and Kairi, only Sora. But seeing as an outfit change for Sora usually leads to other characters getting one too (KH2 and DDD) I think it's safe to assume that it will happen. Can't wait for TGS! :D.
I hope that the Driveforms return in a more epic style. -cartwheels around the house like a lunatic in excitement- This is- OMG! I'm so glad Nomura didn't deny the possibility of playing as the two! More screentime for Kairi? Yes, please! Aww, playing as Kai would be a dream come true for me! Especially since I was starting to worry about them pushing her to the sidelines again in III. Anyway, me hopes that this is dreamceptioned into Nomura's mind, and he goes through with it. It'd be a great tie to BbS if he did! Though I wouldn't mind if they just chose to do this for multiplayer stuff, either. And that tidbit about Sora learning about "the true power of the Keyblade in DDD" was quite interesting. That's right I'm looking forward to that. Okay Thanks. I somehow completely missed that article. So, what style do you think Yoko Shimomura will be scoring KHIII in? Pre-BBS or Post-BBS? Come on nomura give me a playable riku & kairi! I hope so too. Drive Forms were one of my favorite things in the entire series. I hope they return. It doesn't matter. Everything she makes is perfect. Every game has had incredible music. Especially DDD. Dat dream eater theme song. Well you never do know, D23 generally has a lot of surprise and while there definitely won't be a humongous KH event, there could be some KH exclusive stuff they might talk about or merchandise they might release. I'd be content with any recognition of KH by Disney on US soil. I have a strong feeling that one if not both of them are getting playable scenarios because Nomura is not one to lie nor is he one to give huge secrets away so early on. If Nomura said "no, it isn't happening" and it turned out true, he'd be lying, and if he laughed and said he couldn't say anything, that would all but guarantee he has something planned. I feel like the best route for Nomura, if there were scenarios of them planned, would be to say "nothing is planned at the moment" because it's so safe. The Final Mixes are not intended to give Japanese people exclusive DLC the world won't ever get, it's so that the Japanese people can play the game and hear the cutscenes with the US langauges. Remember, in Japan, most people speak Japanese and understand basic English. In the US, barely anyone understands basic Japanese. I do think there will be a Final Mix in Japan so that people can hear the English voices, but you have to remember...DLC EXISTS!!!! If SE never released the extra content overseas as DLC, it would not only be a stupid business decision, but people would get really pissed and SE would have absolutely no excuse. With both games being so hyped up and a lot riding on each, I bet the competition is more along the lines of, who can make a better game overall, not who can get it out faster. I don't think SE is that stupid to try and rush out 2 of the largest titles this decade. Yes, I'm assuming it's more metaphorical and it isn't a keyblade but something else or someone. If it were just a physical object and nobody mentioned it this whole time, it'd be a huge plot hole unless there was some circumstance that made it appear RIGHT NOW and only just now, which I feel would be dumb. Have you read Nomura's past interviews before? Dude always says stuff that never happens. I always thought he said stuff and changed his mind later, not stuff that necessarily is lied about, but even if he does lie a lot (which I guess he does lol), then I'm still hopeful that a Kairi or Riku scenario will happen since he could have just lied about there being no plans at the moment since nothing was decided. Wow! They look so good with the KingdomShader! Goofy looks so bad, I can't even look at him. Goofy kind of scares me, to be honest! My thoughts exactly. Donald is looking quite spiffy on the other hand. Sora looks really good, although his face looks kinda strange. becuase goofy is goofy anyway what do you think sora new outfit looks like? Again, that's not relevant to this thread. okay goofy looks kind of bad i guess we got to get use to it though remember things can change. I think it will. They're still experimenting with their "Kingdom Shader" and these are early character renders, so I'm sure Goofy will have a proper next-gen makeover once they get it figured out. Goofy has always looked weird in those graphics rofl. But Donald looks amazing. I am really excited to see how they are going to do other Disney characters. They look great! *o* well except goofy but still can't wait to see how other characters look! But on a more serious note, I think all the original villians are going to look sick. Hopefully they do Maleficent and Pete justice as well. Pretty much every Disney character is going to be tricky. Hopefully they all look like Donald and not Goofy. Beautiful, I don't get why you guys think Goofy is ugly, I think he looks great, and he really is goofy. Man oh man Donald is do dashing. He just looks... not like himself. There's something off about him. Can't quite put my finger on exactly what it is though. I don't get all the Goofy hate, but whatever. The gang looks amazing!!!!! I can't wait until TGS to get more details. Hopefully they will give us a rough release date. Most likely not, but I can hope! It's not hate. We like Goofy but he looks very weird here. I can't wait until TGS to get more details. Hopefully they will give us a rough release date. Most likely not, but I can hope! And hopefully they can announce HD 2.5 ReMIX while they're at it and give it a Q2 2014 release window! Well 1.5 had Q1 release. Unless you mean western release but I doubt theyd give any info on that at TGS. Hate? Oh gods no. We love Goofy! He just looks really odd in this new style is all. It's very new Disney (i.e. the new Disney Princess designs) and it's weird to see such a change after eleven years of the same design. Possibly featuring online capabilities and playing as Kairi and Riku, and Sora cultivating relationships with the AI/NPCs? I can be all about that. I can't wait to get my hand on that picture in better quality. I've been drooling over it since E3. Everyone looks great to me. Maybe people are weirded out by Goofy's stance and the shadows cast on his face? Maybe people are weirded out by Goofy's stance and the shadows cast on his face? His face in general is what's weird. I've found it weird since the FOFF event. Goofy has a sort of realistic skin texture like Sora's and that's what makes it look weird to me. I actually think the render looks great. The posing could probably have been different but this is not out of his character. Oh man, it's Goofy, he's supposed to look like a goofball and make weird expressions (and in-game he's usually smarter than both Donald and Sora and observes things faster than them. ;P). What are people seeing that I'm not? I think Goofy looks like Goofy here...? It's Sora who I think looks weird,imo. Yeah, if anything Goofy looks a lot more true to how he looks in the cartoons. Which is the whole point of the Kingdom Shader. Sure, it's not how he looked in past games, but that's because they weren't able to do what they're able to do with the KS. Exactly. There was nothing weird about *that* and certainly no skin textures. It has nothing to do with his pose. His face is weird, not in a "goofy" way either. His face is too skinny? It's hard to describe but it's not how it usually looks. I'm not seeing what's so wrong with Goofy here looks pretty normal. Oh man look at crispness of Sora's face are these the models there going to be using for the cutscenes? I really intrigued about this Kingdom Shader I can't wait to see the new models for Riku,Kairi, and MX next-gen KH you're finally here :'). Goofy is that way in some of the cartoons. But he is more down to earth in comparison to the others. Yeah I meant the western release, but you're right. They'll probably announce the eastern release if they announce it at all. They'd better announce it, damn it. They will. They have been very open with talking about KH2HD so it definately is in the works and there is no other events that make sense for announcement than TGS and few smaller ones so they will go with TGS. I think they will just say something like ''early 2014'' and it will be around March like 1.5. Take or add a month or something depending how they want to space their releases. I do think it has something to do with the posing. I shading is a bit weird, but besides that, his face does look a little odd and that could be because of the way his face is angled. I'm not going to make a judgement on it until we see his face in a different pose, then we'll know if it was an angle thing or not. On the topic of the Kingdom Shader, I really want to see how that effects the Disney worlds themselves. I know it's been done before, but I really want Little Mermaid to appear in this game because I'd love to see all the underwater things affected by these graphics and how SDG are affected by the Kingdom Shader in Atlantica. I don't think they have to announce it. It is going to happen, there really is no reason for it not to happen and any doubts I think are just based on nothing but worry in all honesty.